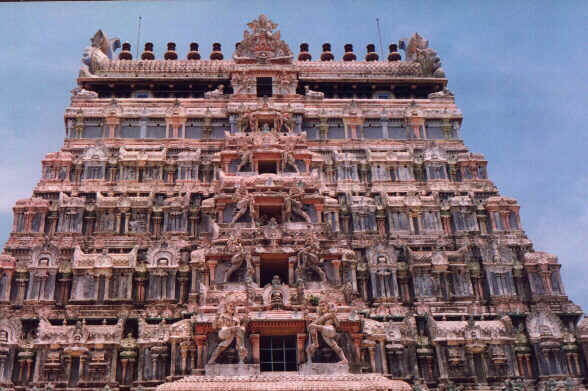 Chidambaram is one of the most ancient and most celebrated of shrines in India. It is of great religious as well as historic and cultural significance. Chidambaram is associated with Nataraja, or Shiva in his Ananda Tandava pose (the Cosmic Dance of bliss) in the cosmic golden hall and the hall of consciousness (Chit Sabha). Shiva is also worshipped in the "formless form" of the Chidambara Rahasyam, while the temple is known for its Aakasa Lingam, an embodiment of Shiva as formless Space. The word "Koyil" or temple in the Tamil Saivite tradition refers to none other than the Chidambaram Nataraja temple. Chidambaram is one of the Panchabhoota Stalams signifying the 5 elements of wind (Kalahasti), water (Tiruvanaikka), fire (Tiruvannamalai), earth (Kanchipuram) and space (Chidambaram). Chidambaram is one of the 5 dance Halls of Shiva (Kanakasabhai).The other four are Madurai, Tiruvalankadu, Tirunelveli and Kutralam. Also housed in the vast temple complex is the Vaishnava shrine Tiruchitrakootam dedicated to Govindaraaja Perumaal. The Chidambaram temple complex reflects a collection of architectural and sculptural styles assimilated over several centuries. Of special significance here are the towering gopurams and the sculptural illustrations of the various poses observed in the Bharata Natyam Classical Dance form of India. Chjdambaram is also known for its hoary tradition of grand festivals. The temple town of Chidambaram is home to the Annamalai University, and it has several modern lodging facilities. The Tamilnadu Tourist Development Corporation operates one of its hotels at Chidambaram. Chidambaram is on the Chennai Tiruchirappalli Main line, between Villuppuram and Thanjavur. It is well connected with Chennai by a host of train and bus services. By road it is only 235 kilometers South of Chennai. Thanjavur is only about 100 kilometers away from Chidambaram. Chidambaram is literally the Northern gateway to the temple trough of Tamilnadu - the Thanjavur - Tiruvarur - Nagapattinam districts featuring hundreds and hundreds of ancient temples, which can be easily accessed from the towns of Mayiladuturai, Kumbhakonam, Thanjavur, Tiruvarur and Nagapattinam.